Discussion in 'Games In Development' started by Mrs_Allykat, Jun 11, 2018. Well, she loves being an Aetherist, but hates having to operate as a Spacer Association field agent. Chasing down the dregs of society, loitering in the shadier side of town, and doing so without causing a scene. She's an Aetherist, all of her "spells" are flashy! If that wasn't enough, her grandfather informed her that she's got an arranged marriage coming up with another spacer agent no less! It's 1878, and her late parents couldn't have known about the Spacer Association. If they did, there is no way they could have approved of it. Then, as if to add insult to injury, the Spacer Association lost track of his whereabouts! All of this, and they called her into work on a Sunday to boot! 04-21-2019, There are two Demos available from the same link below, the "Boss Demo" and the "Full Demo." Both are saved to the itch.io page for Port Phobos. Port Phobos and the Aether Frigates takes place in an alternate history, one built out of the classic science fiction of the late 19'th century. A place that's an odd cross-breed of a Victorian society, Steam-Punk technology, and just a dash of the old west. Gunslingers, Aether-tech-mages, and Space Pirates collide in an adventure spanning the inner planets of the Solar System. Venus: The jungle world, our celestial neighbor, looks like some kind of rain forest, but is that really all there is? Neith: A moon of Venus, Neith is a world that was quickly settled by humanity during the first space war, and the home of steam-tech. Mars: The infamous red-planet. With it's red grasslands and cat-people aliens; there is no wonder that it was the first place the Spacer Association placed an outpost. Phobos: If Priscilla was asked, she'd say "This place is just weird." A small moon with purple grass, flying pigs, and some kind of alien plant-life - this place is probably not terribly friendly to outsiders. Wait... Why is there a human settlement here?!!? Priscilla Payne: A hot-shot young Aether Mage who suddenly finds out she has an arranged marriage and that her fiance is missing. Professor Steamshot: Priscilla's grandfather, who's a little off his rocker since the death of his daughter's family. Dusty Sherman: A former deputy turned spacer to see the planets and Kip's best friend. The Invasion War, a failed effort of the Deimos aliens created a chain effect, and the humans from earth entered space looking for them. The Earthians learned of the Aether, how to build zepplins that could reach orbit, and how to use the winds of Aether to sail across space. In doing so, the people of Earth hoped to find and stop the aliens from trying to invade a second time. It didn't take long after reaching the orbit of Mars to find the aliens either. That's how the First Space War started. After being accepted by the Aether Mage Academy, Priscilla's parents were caught up in the first space war leaving her and her brother in the care of their grandfather Professor Steamshot. "Everything is possible with Aether and Steam," that's the motto Priscilla's grandfather lives by. Unfortunately for her, his tunnel vision left a lot to be desired concerning anything else. Now there are outlaws to be hunted, aliens to figure out, worlds to explore, and a finance she has to find. This is a work in progress, so the images and video below are subject to change! If the embedded video does not work, try This Link instead. This is the boss at the end of the first dungeon, found after clearing several floors of a mine. The introductory dungeon introduces several plot elements and world-building along the way. 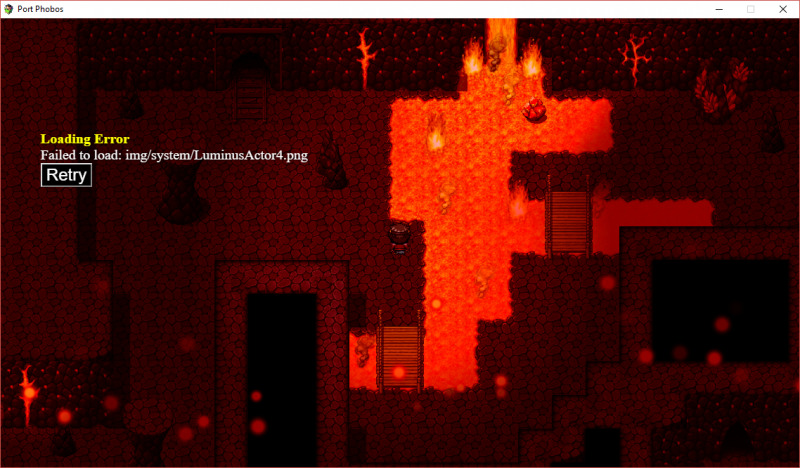 Upon clearing the mine, the player is then swapped to the other player-actors to have the plot develop. This boss is not the gateway keeper to further dungeoning, but is symbolic of the story moving from introductions to actual progression. Big thanks to @SmashArtist for the title border! Rose Guardian, Kaimi, MagicPizzaGuy and 4 others like this. The Stranger, Sauteed_Onion and Mrs_Allykat like this. @Marquise* You found it before I did! Marquise*, Sauteed_Onion and The Stranger like this. Your maps are very pretty. There's just enough detail to make your eyes go "ohhhh, me like" without being too cluttered. Keep up the great work! Mrs_Allykat, Sauteed_Onion and The Stranger like this. Your game looks and sounds so bloody good. I really like what I see so far, but am especially fond of the flying pigs. By the way, that video doesn't seem to work for me. Not sure if I'm the only one who can't get it to play, might be because I'm using Adblock. Marquise*, Mrs_Allykat and Sauteed_Onion like this. Love the city maps, meow. Marquise*, The Stranger and Mrs_Allykat like this. @The Stranger I just put in a link to streamable. Odd. How about a direct LINK ? Marquise*, Sauteed_Onion and Mrs_Allykat like this. Just report your first post, and someone will take care of it. Ack! I thought you were mod, but instead you're just awesome. Marquise* and Mrs_Allykat like this. Your game looks nice, and looks like a lot of fun. I look forward to playing it. Thanks to all! The Itch page is up with the demo boss fight downloadable and linked to from the main post at the top. Again, thanks for all the support and kind words! @Kes thank you for the move! I hate to tell you but you have a file missing when I go to the status screen. I know you probably used the MV Stripper but I must warn you it does remove files you need sometimes. So after using it just check your folders to make sure you don't have to put them back. @Rose Guardian Close, but the file isn't missing, it's a plugin that's not reading the .rpgmvp file. I've seen this before, and am correcting the archive. Thanks a ton for that catch. I tested the game, but not the status menu - I forgot I used a plugin for that. Really appreciate the catch!